SCVHistory.com LW3044 | Lebec | Charles Lindbergh Goes Gliding in Lebec, 1930. 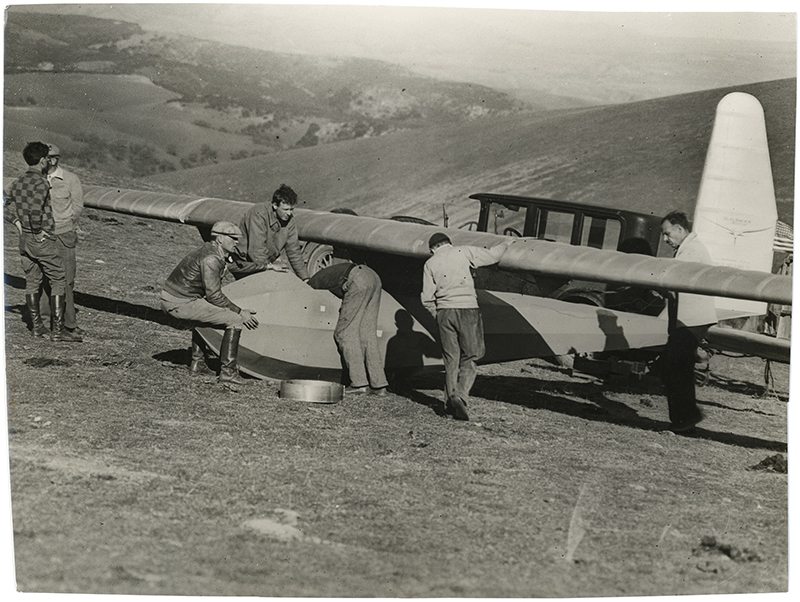 February 1930 — Aviator Charles A. Lindbergh (center-left) leans over the nose of a Hawley Bowlus glider as it's being prepared for a test flight in the hills above Lebec. Photo by George Watson (4x5 Speed Graphic camera, 4x5-inch film). Early 7x9-inch copy print from the Watson Archive. The famous aviator Col. Charles A. Lindbergh conducted "gliding experiments" in Lebec the first week of February 1930 with W. Hawley Bowlus, who was considered America's foremost gliding pilot according to Popular Science Monthly, which did a 3-page photo spread in its May 1930 edition as seen here. Together they established a mountain camp to learn the "new sport of motorless flying." These were halcyon times for the most famous man in the world — three years after his triumphant solo flight across the Atlantic in the Spirit of St. Louis, and two years before the kidnapping and murder of his 20-month-old son, Charles Jr., by Bruno Richard Hauptmann. There are unproved rumors that in the aftermath of the kidnapping, Lindbergh would sometimes hide from the paparazzi at the Newhall home of a friend, William S. Hart. LW3044: 9600 dpi jpeg from early copy print purchased 2017 by Leon Worden.